recently my best friend, Morgan, reached out to me and suggested i do a post on this “magical” powder called matcha that tasted just like green tea. naturally, i was skeptical at first because i have my specific starbucks order and i rarely stray. the last time i strayed from my usual (trente green iced tea with three and a half pumps of classic, but who is keeping tabs) was when i tried the flat white, which is now my morning must. 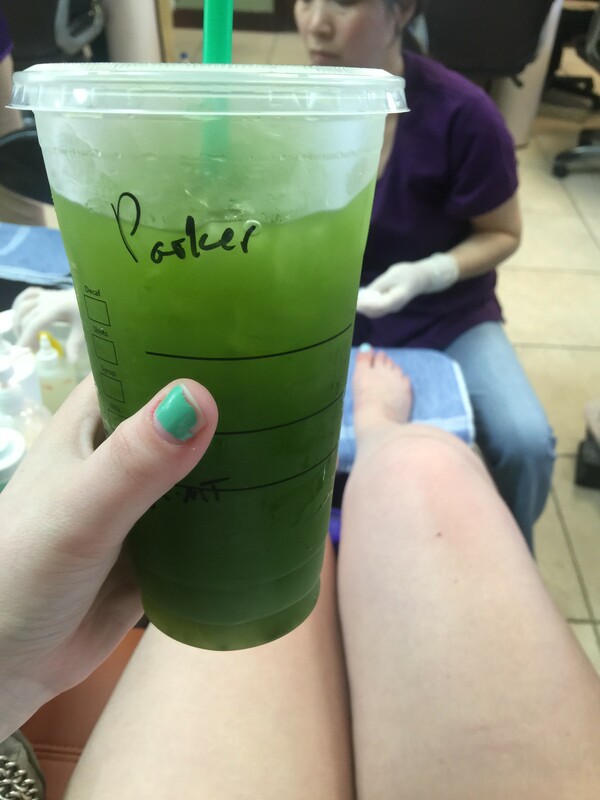 today, i tried the magical matcha before i went to get my nails done, (thankfully, i mean look at my nail). not only was the matcha incredibly delicious, it was EIGHTY NINE CENTS. CENTS PEOPLE, WE ARE TALKING IN CENTS. matcha is actually ground up green tea leaves. instead of steeping the leaves in hot water and infusing the benefits, matcha gives you every single benefit of green tea times ten! drinking a cup of matcha is like drinking 10 cups of regular green tea. by providing you a boost and keeping you healthy, matcha is the best source of key nutrients if you are looking for a healthy alternative to your morning coffee. IS THERE ANYTHING ELSE I SHOULD KNOW ABOUT MATCHA? one last thing to add about matcha is the risk of lead poisoning. now, don’t freak out just because i said that. green tea leaves are naturally a source of lead. since you steep the green tea leaves, lead poisoning isn’t a concern when it is just steeping. since matcha is the actual green tea leaves ground up, there are very small amounts of lead in it. with that being said, the recommendation is that you only have ONE SERVING DAILY. HOW CAN I GET THE MOST OUT OF MY MATCHA? now, get on out there and get your matcha on y’all!